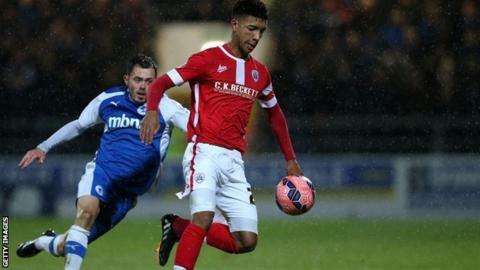 Barnsley chief executive Ben Mansford says the League One club are hopeful of getting teenage defender Mason Holgate to sign a new contract. The 18-year-old made his debut against Doncaster this month and has recently been linked with Premier League sides Arsenal and Tottenham. Mansford told BBC Radio Sheffield: "There's nothing in that as far as I know and we haven't received an offer. "Mason will be getting a new contract offer in the next few days from us." He added: "He has earned that right and it will be down to him, his parents and his advisors to discuss that. "He is contracted to us for another 18 months and at this moment in time he is going nowhere and we are not courting offers for him." Holgate, who joined the club's academy as a nine-year-old, has made five appearances for Barnsley. Meanwhile, Mansford is unsure whether they will be able to retain Crystal Palace loanee Peter Ramage because of the Premier League side's managerial situation. Ramage, 31, has made 15 appearances for the Tykes this season and has not played for his parent club since August 2013. The Eagles currently have Keith Millen in caretaker charge after sacking Neil Warnock on Saturday. "Everyone here likes Peter as both a player and as a person. I think there was scope to do something with Palace but then they've lost their manager," Mansford said. "They know that we would like to keep him for the rest of the season. Hopefully nothing has changed with them on that position and he wants to stay here." Barnsley were due to host Oldham on Monday but the match at Oakwell was postponed because of concerns over player safety.